During this past year, Gus has received so much of our time, love and attention. He has become our flagship Photo Bus! We have been renting out vintage VW Buses for vacations in Florida since 2010, and we wanted to do something a little different. In response to the many requests for our busses to provide a sweet nostalgic touch to wedding celebrations, we decided to turn one into a photo booth to add to the experience. If you have been searching for something exciting and very unique, you have hit the motherlode! The VW Bus symbolises a time of freedom, love, and peace always bringing smiles to faces young and old. Combine that amazing essence of the fun experience of climbing into a VW Bus Photo Booth; the possibilities are endless, and the memories begin! If you remember the coin-operated photo booths from the '70's, you will recall how they operate. Traditionally, photo booths contain a seat or bench designed to seat one or two patrons being photographed. The seat is typically surrounded by a curtain to allow for some privacy and to avoid outside interference during the photobooth session. Once the payment is made, the photo booth will take a series of photographs and print out a series of photos. In this case, we have modified Gus by adding the photo booth inside giving your pictures the vintage VW background! We use a high-quality camera and printer for great photos. The photos are instantly printed onsite for the guests to keep. We can design the photos to include any information you would like about the event as well. After the event is over, we will digitally transfer all of the photos to you. The quality of the pictures makes it easy to enlarge, edit, and save the photos as you desire. 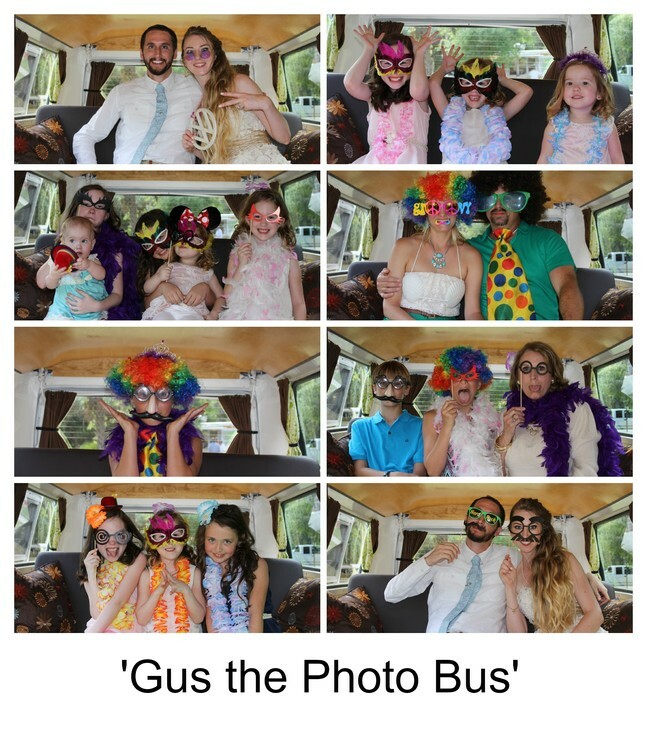 Let Gus the Photo Bus help make your next event exciting, unique and far-out groovy! $250.00 Reservation Deposit is required to hold the dates you have requested. in writing 60 days prior to event date.